Self-sufficient House - MMA - MAISON - MODULAIRE AUTONOME - Inc.
​The self-contained house is part of what are called passive houses, with very low energy consumption. Less than 15 KWh per cubic meter per year for heating, less than 50% of primary energy, that is what defines the "Passivhaus" according to a German concept and standard. 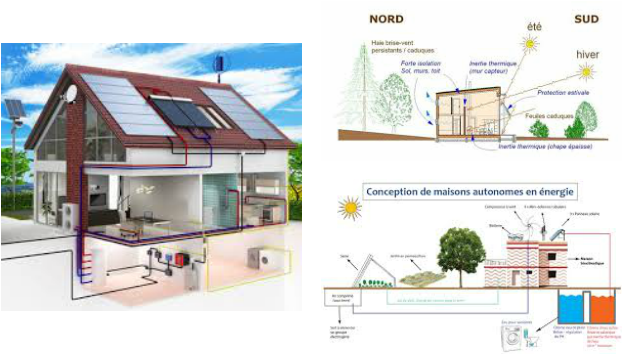 In this context, the autonomous house does not use the traditional networks of electricity, water and gas supply. 1- Excellent insulation, adapted lifestyle and recovery of free energies, including those provided by man and machines. 2- As with all types of passive houses, we are talking about a label and not a compulsory regulation. But the autonomous house is also called "zero energy house" in the sense that it does not use any energy source, even with a passive solar or solar architecture. The first strength of the autonomous house lies in its isolation, whether external or internal. In addition to thick walls and insulation, triple glazing is required and the roof must be vegetalized. The latter provides sound insulation, thermal comfort (mainly in the hottest regions), water and air tightness, and wind resistance. ​​To be autonomous, the house then combines several techniques of free energy recovery. The solar panels can thus be coupled with a wind turbine, a heating floor, and a heat pump. Heating, electricity and cooking are thus provided daily. Still the water. In the absence of a natural source, the autonomous house is equipped with a system of recovery and filtration of rainwater, including those of the vegetated roof which retains between 50 and 80%. etc ... Attention however, the use as drinking water is forbidden. The autonomous house, even if it represents an additional cost to the construction allows to realize enormous savings of energy in the long term. Your energy footprint will be completely neutral, it is the most ecological solution that is when designing your home. One problem you may encounter if you want to build a passive house is that few builders offer this kind of ecological home.